When a prospective renter visits your online rental listings and decides to apply for a property, you may request additional documentation such as a copy of a driver’s license or paycheck stub as part of the application. Rentec Direct’s software now supports file attachments to online rental applications. 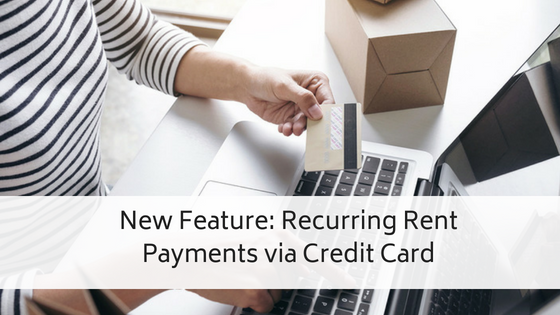 Your prospective renters will be able to attach images (.png/.jpg) and Adobe Acrobat files (.pdf) when they apply online. When you review your rental applications, you will be able to retrieve and view these attachments. The first step is to make this new feature visible to online applicants. Step 1 – In your Rentec Direct Admin Account, visit Settings -> Rental Application Defaults. Step 2 – You will see a new option to enable the file attachments to application feature. Step 3 – Under “Customizable Parameters”, provide clear instructions on what specific documents you require. These instructions will appear above the file upload area in the application. Step 4 – Save the new settings. How Does The Renter Attach Files? 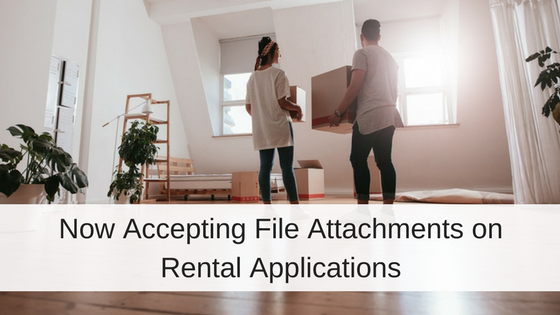 When a prospective renter uses the online application process, the Confirmation page contains a new file upload area. Only images (.jpg or .png) or PDF documents are allowed. The applicant will be able to upload files from their device’s local hard drive or the user can use their mobile device camera to take a snapshot. After uploading, the applicant can delete a file by clicking the X below it. Or, the the applicant can review their uploaded image by clicking on it. The review popup provides an option to rotate the image, in case the orientation is incorrect. When it is time for you to review your rental applications, the attached documents will appear at left below the action buttons. The standard right-click menu applies, allowing you to rotate or download the attachments. 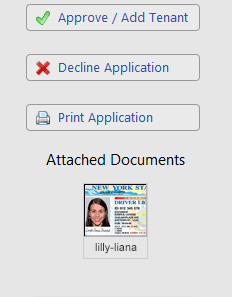 When you print the application, any attached images are printed at the bottom. Attached PDF documents must be printed separately. If an applicant is approved and converted to a tenant, the rental application will be associated to that tenant’s record. When you select Edit Tenant, a link appears below the tenant’s picture, allowing you to review the original application and supporting attached documents. Because they are attachments to applications, these files will not be shown in your File Library. This new feature enhances your tenant screening process and is a potential time saver, allowing you to easily receive application support documents from your rental applicants. By providing the best options for accepting and reviewing rental applicants, we hope you are able to find qualified, long-term tenants for your properties. The rental application file attachments feature is a result of requests and suggestions by Rentec Direct clients like yourself. Please feel free to let us know, in the comments section below, how we can make our system better serve your needs. What about attaching a file to rental applications? Such as a release form? That is in our to-do list, for sure. Thanks for that brilliant comment! When a prospective renter visits your online rental listings and decides to apply for a property, you may request additional documentation such as a copy of a driver’s license or paycheck stub as part of the application. Rental Direct’s software now supports file attachments to online rental applications. This is great news! Thanks! I second! The ability to add documents to the rental application such as releases would be wonderful! Would this work for an RV park and Storage unit rental management?